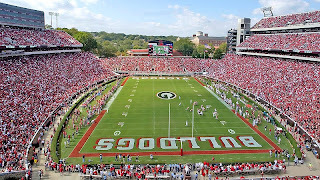 Georgia Sports Blog: Rose or Sugar? For my money, let's go to Pasadena. We have a path to the Sugar Bowl in nearly ever season. We haven't been in the running to go to the Rose Bowl but once in the last 70+ years. Plus, we've never played Oklahoma. Yesterday was one of those other worldly days. I spent several hours after the game randomly exclaiming some variation of 'Holy Crap!' due to the memory of the SEC Championship Game sneaking up on me. Admit it, you did, too.